Sayings, proverbs, phrases, words of wisdom: whatever you call them, the reason that they are so ubiquitous and well-known to everybody is simply that they are said so often. Why? Because each contains a truth that is relevant to each subsequent generation. Many proverbs advise keeping a sharp eye on your finances and the truism 'Buy Cheap, Buy Twice' is definitely one to pay attention to, whatever it is you're buying. When you're purchasing forklift trucks and other materials handling equipment, you are making an investment. That investment, like any other, is designed to bring profitable returns by facilitating the needs of a business. If the truck isn't up to scratch, you could end up having to spend more money on repairs or on buying a better, more reliable machine. Add to this the downtime that breakdowns cause and you could be looking at a really bad investment in which, to use another financial proverb, you start throwing good money after bad. Matt Waterman is the Managing Director of Waterman's Hair Care Products, a growing business based in Doncaster. As a hands-on member of the team, Matt takes a personal interest in all aspects of the business and recently purchased a used forklift truck from auction website eBay: like so many other online purchases, the truck turned out to differ quite significantly from its advertisement. Waterman's is located in a busy, thriving area of Doncaster and the business owners there like to work together to make things more agreeable and profitable for all. 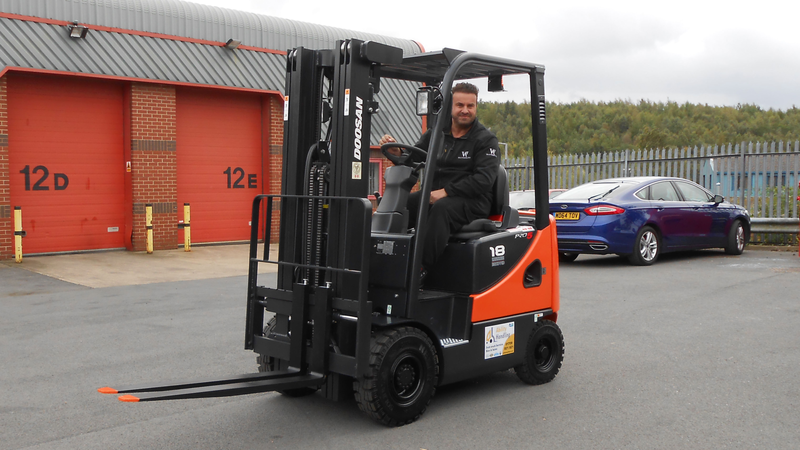 This is how Matt found himself at a company just two doors away, trying out their forklift truck to compare it with his recent eBay purchase. The neighbouring company own and operate a Doosan D25S-2: Matt was seriously impressed with this truck and was surprised to discover that the machine is now 18 years old and still providing perfect service. Matt didn't need any more convincing and went online to find his local Doosan dealer, which is where Ability Handling come into the picture. Jim Quinn, who looks after customers in the Doncaster area, wasted no time in finding out all the essential information required, discussing Matt's required specification on the phone before making a personal visit with his quotation that same afternoon. Jim recommended a Doosan D18S-5 and Matt immediately made out the purchase order. The new forklift was delivered to Waterman's within the week; Jim made another personal visit on the delivery day to provide a thorough tutorial on operating the forklift, making sure that it will be used safely and that Waterman's will get the most from their investment. Matt gave Ability Handling a big thumbs-up, thanking us for the recommendation, fast delivery and personalised service. Just doing our job! Don't buy cheap and don't buy twice. Do it the Doosan Way with Ability Handling.